Tapered Roller Bearings with TURBO Profile (similar to logarithmic profile) are specially designed for automotive application, considering road, operating and environment conditions. We always focus on the parameters which increase the performance/life of bearings. We have carried out several improvements in material, design and manufacturing processes, including geometrical accuracy and profile of raceway. The logarithmic type profile results in avoiding edge loading in the raceways. 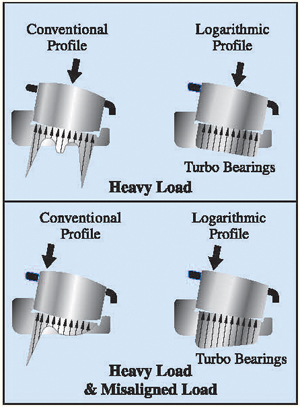 TURBO-Profile type bearings having inimitable feature & benefits. • Improved load carrying capacity. • Reduced friction and initial torque. • Reduced wear and maintenance. • Reduced failure in misalignment. • Increased bearing service life. • This profile is superior to conventional profile. • Results in uniform stress distribution. • Reduced peak stress during shock load. • Better performance under critical operating conditions where heavy load and considerable misalignment pertain. 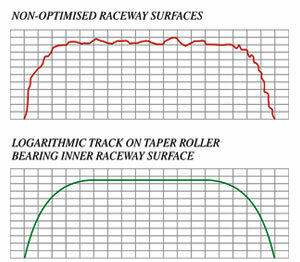 • Reduced edge stress at raceways.